In my opinion, not only is bourbon an excellent spirit to pair with cigars, but I’m constantly impressed by the value it offers at all price points. While good single malt seems to start at $50 (if you disagree, please leave suggestions in the comments), good bourbon can be had for quite a bit less. If you’re willing to spend $50 or more there there are some really special bourbons available (take a look at my recent Guide to Bourbon series for some recommendations), but it isn’t necessary to spend that much. Elmer T. Lee – Elmer T. Lee created Blanton’s ($45-50), the highly acclaimed nine-year-old original single barrel bourbon. Later he created his own single barrel bourbon, which sells for $30. Sadly, Elmer isn’t around anymore – though he hand-selected the barrels for his bourbon until his passing – but this is still an excellent spirit. Basically just Blanton’s but a few years younger, it’s full of sweetness with body and balance provided by dried fruit and just enough woody spice. Evan Williams Single Barrel Vintage – Evan Williams took Single Barrel bourbon to a new level with it’s vintage release, bottled every year after nine years of barrel aging. Each year has its own character, but they have in common a butterscotch characteristic with oak and a bit of spice. The 2003 is out now. W.L. Weller 12 Year – The oldest sub-$30 bourbon I know, this uses wheat instead of rye as a secondary grain, and the result is a delicious combination of sweetness and woodiness. These are the same characteristics that make Pappy Van Winkle one of the most sought-after bourbons, but it’s only a small fraction of the price. John E. Fitzgerald Larceny Bourbon – A new offering made by Heaven Hill, which also makes Evan Williams, Larceny (like Weller) is a wheat bourbon, which means it has plenty of sweetness. There’s also a lively combination of toffee, cinnamon, and fruit. It’s 92-proof and around $28. Eagle Rare Single Barrel 10 Year – Were I required to select only one of these, I’d have no problem selecting Eagle Rare 10 Year Single Barrel. Made by Buffalo Trace from the same juice that makes up George T. Stagg, it has lots of char, oak, caramel, and guts. It’s the perfect combination of balance, nuance, and power. Honorable Mention: Bulleit Rye – Not actually a bourbon (rye is the majority grain as opposed to corn), this is my favorite value in rye. It uses a 95% rye mashbill and has a flavor of red fruit, minty spice, and just the right amount of oak and syrupy sweetness. If you want to discover the difference between bourbon and rye, this is a tasty first step. Still getting into bourbon? This is a list that will give you a crash course in all the most American spirit can offer. And it will show you that excellent bourbon can be had at a very reasonable price. 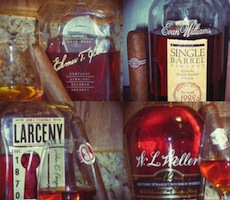 Couldn't sgre more with ETL (my old favorite), Eagle Rare (my new favorite), and Weller. Haven't tried the others, but will now! Bulleit Rye is good for mixing and good for the price, in my opinion. It's just MGP juice (formerly LDI) and is the same juice you see in every other 95% rye out there. Angel's Envy, and a million other. I also just like plain old Sazerac for Manhattans, Old Fashioneds, Old Pals, etc as well. Decent on its own, too, similarly priced. Your 5 choices are superb by the way, for the under $30 set. what happened to Knob Hill on your list? Knob Creek (I assume that’s what you mean) isn’t under $30 in most markets, certainly not in Virginia where I am. If it were, it would likely be on this list. George Dickel 12 year old Whisky, (Ivory label), is a fine alternative to Jack Daniels. They are made within an hour or so of each other in Tennessee. Yes, I know it is not a bourbon, per se, but it is a fine drink for sure! Would like to see a review of the various varieties offered by George Dickel compared to the various Jack Daniels products offered in a head to head article.